CCS C Compilers are designed specifically for the PIC® MCU architecture, unlike competitive compilers based on a GNU or common engine with a generic code generator. 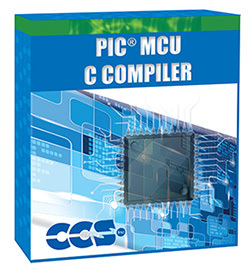 Every aspect of the CCS C Compiler is specially optimized for the PIC® MCU. The Pro-Level Optimization of our PIC® compilers include Standard C Constructs, numerous Pre-Processor Functions, and the largest library of Built-In Functions. This provides developers with unique access to device hardware features at the embedded C language level. C syntax and special functions have a uniform syntax across all chip families, allowing for migration to a new chip trivial. 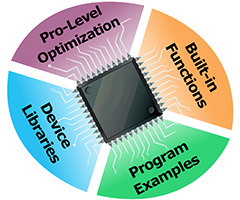 Ready-to-Run Program Examples, and Device Libraries, empower rapid development of applications incorporating leading edge technologies such as capacitive touch, wired and wireless communications, motion and motor controls, and energy management. All of our compilers are ANSI C Compliant with Pro-Level Optimization. We offer flexible software configurations to fit any project requirements. Compilers are compatible with many third-party tools such as Microchip MPLAB® and MPLAB® X. Device specific include files contain all the information the compiler needs to optimize code generation for the specific PIC® MCU. Flexible constant data structure handling allows the compiler to handle lookup tables that are virtually unlimited in size. This is of particular interest to developers using large lookup tables for trigonometric functions or storing FPGA configuration memory images in on-chip MCU memory. Constants (including strings and arrays) are saved in program memory. DSP performance can be enhanced by manually assigning variables to data spaces for faster access with pre-processor directives. Our compilers contain hundreds of built-in functions that simplify access to hardware while producing efficient and highly optimized code. Why "recreate the wheel" coding your own functions in assembly or C? Many libraries are supplied with our CCS C Compiler products to aid in your embedded development. The CCS C compiler includes a library of example programs for many common applications. Each example program contains a header with instructions on how to run the example, and if necessary, the wiring instructions for interfacing external devices. FAT - Access/read/write files on a SD/MMC card that has a FAT file system. Run a long term log on your PIC® MCU, saving each entry by appending to a file. Then read the results on your PC by opening the file. SIM/SMART Card - Access the contact and phone number information on a SIM/SMART card, commonly found on GSM/GPRS cell phones. Frequency Generator - Generate tones, frequencies and DTMF using only one user define general purpose I/O pin. This is done by implementing a software PWM on one pin. XTEA Cipher Library - Transmit encrypted data between two PIC® MCUs using XTEA Encryption. XML Parser - Parse XML documents using the minimal resources of a PIC® MCU.